The Silky Terrier is a unique breed among dogs. 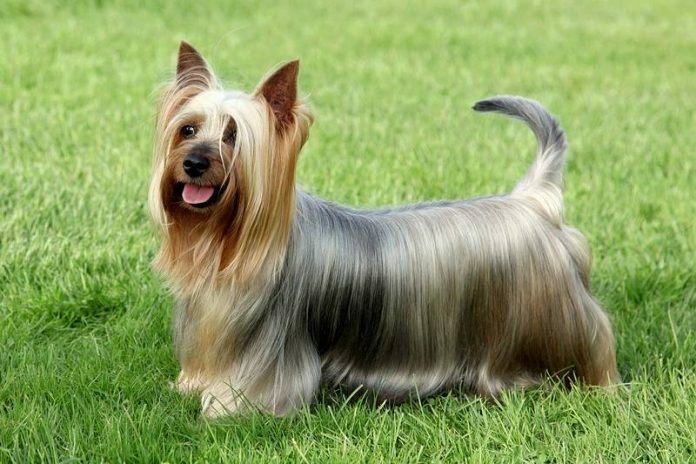 Bred to be a beautiful and useful breed, the Silky Terrier straddles the line between elegance and sturdiness. Another remarkable feature of this breed is its tiny size. It is the smallest of all the terrier breeds. It is so small, in fact, that it must be shown with toy dogs instead of its own category of terriers! The Silky Terrier was created in the 1800s in Australia. There, the Yorkshire Terrier and the Australian Terrier were crossed to create the new Silky Terrier breed. Surprisingly, breeders may have accidentally created this beautiful new breed, since no records exist proving that this breeding was intentional. However, in the early 1900s, stricter breeding protocols required more clarity. Through these protocols, the Silky Terrier was fully developed. At only ten inches tall and approximately ten pounds, this beautiful new breed was originally called the Sydney Silky and served mostly as a house pet. Some dogs occasionally worked as snake control for their urban families. After World War II, the popularity of Silky Terriers spiked, and they began working their way to loving homes around the world. This dog breed is defined by its long, flowing, and glossy coat that lies flat, parted along their back. Their coat also nearly reaches near the ground. The colors of their coat range from grey and white to blue and tan to a tricolor blend. Their hair is fine, and due to its texture and length is susceptible to mats and tangles. Therefore, this breed requires professional grooming approximately once a month in addition to daily brushing. However, the hard work to maintain this dog’s lovely coat is well worth it. Most importantly to the many hopeful dog owners with a sensitivity to dog dander, the Silky Terrier is hypoallergenic due to its lovely hair instead of traditional fur. The Silky Terrier is an inquisitive and clever dog breed. These dogs are quick to learn new tricks in the realms of both obedience and agility, and they have a big, sometimes stubborn personality. Silky Terriers are also extremely possessive of their toys. However, they love their family’s attention. This breed is an ideal family dog, with a playful and intelligent nature. That said, they do best with owners who understand and appreciate their unique personalities. They bark often, and although they are often friendly to cats, they may chase them due to their terrier nature. Silky Terriers have a high hunting instinct, which makes them perfect candidates to play fetch. They make perfect playmates for considerate, older children. However, all play should be done on leash or in a controlled area, as these dogs have a tendency to wander (or dash) away. Time spent in an enclosed area should also be monitored, as these energetic dogs also love to dig. However, a quick toss of a toy or a play session paired with a walk should easily fulfil their attention and exercise needs. Additionally, they may prove difficult to housebreak at first, as their bladders are incredibly small. They can also be dominant towards other dogs and animals, and they can become easily startled by loud noises or new situations. Spending time to get to know your unique dog and show it new situations will build trust between you two as well as the opportunity to get to know its personality. The Silky Terrier lifespan is approximately eleven to fourteen years. Like many other terriers, they are prone to teeth and gum problems, and they should receive teeth brushing when receiving other grooming. They may also develop patellar luxation, Legg-Perthes disease, diabetes, allergies, epilepsy, or other health conditions. Additionally, traditional collars and leashes should not be used on the Silky Terrier to prevent tracheal collapse. Instead, harnesses should be used to walk Silky Terriers to protect their sensitive windpipes. The Silky Terrier is a clever and affectionate dog who loves to play. Look for a trusted and reputable breeder or rescue and adoption agency to welcome this intelligent, fun dog into your own home. Thanks for the info about my Yorki Willie. Now i know je is a silky Yorki. He is so smart and a lot of fun playing with his toy. Gives me a lot of laughter with his cute tiny face. He was given to me after his master died b/c they wouldn’t be home enough. Due to fire was in a shelter with me. He is very smart. He gave every one smiles even with the ones that lost their homes. He is given lots of Love and Kisses every day. So proud to have him. Thanks Again.